Talking 29 06 2015 – Micro-Box A.I.O V3.0.0.8 : FIRST IN THE WORLD – S6 & S6EDGE READCODE !! S6 & S6EDGE READ CODE !! S6 FAMILY ! FIRST & UNIQUE IN THE WORLD ! Posted in GPGIndustries News, GSMHosting News | Comments Off on Talking 29 06 2015 – Micro-Box A.I.O V3.0.0.8 : FIRST IN THE WORLD – S6 & S6EDGE READCODE !! Extract Current Data, Extract Call logs, Sms & Much More. SM-A500F – Factory Direct Unlock. SM-A500F1 – Factory Direct Unlock. SM-A500FQ – Factory Direct Unlock. SM-A500FU – Factory Direct Unlock. SM-A500H – Factory Direct Unlock. SM-A500HQ – Factory Direct Unlock. SM-A500K – Factory Direct Unlock. SM-A500L – Factory Direct Unlock. SM-A500M – Factory Direct Unlock. SM-A500S – Factory Direct Unlock. SM-A500X – Factory Direct Unlock. SM-A500XZ – Factory Direct Unlock. SM-A500Y – Factory Direct Unlock. SM-A500YZ – Factory Direct Unlock. SM-A300F – Factory Direct Unlock. 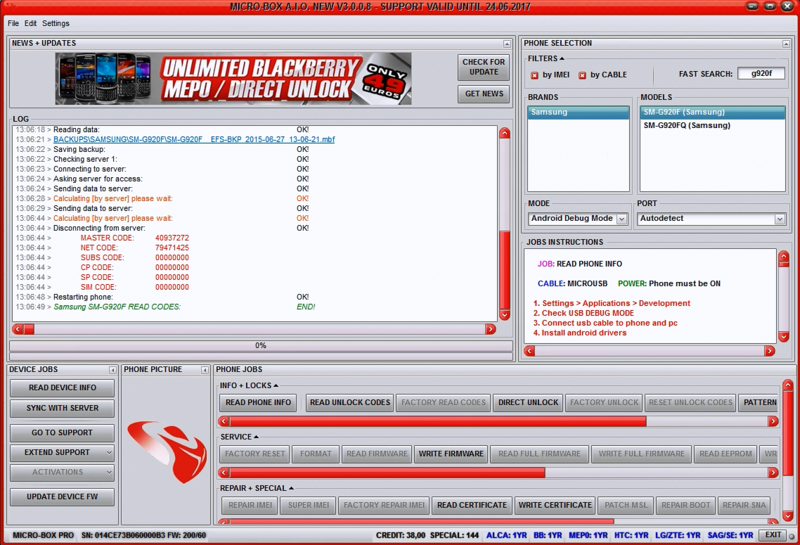 SM-A300FU – Factory Direct Unlock. More good news soon regards latest Samsung Models, stay tuned…. FULLY TO AVOID HAVING ISSUES. Alcatel OT-4036E Direct unlock(beta)/Imei repair/Full service. EasyJtag Update v2.0.2.0 Released. Lot of new inside. 1. Boot Repair via USB for WP 8.0/8.1 Phones now Supports QUALCOMM DRIVERS. —> You don’t have to install “Nokia Emergency Driver” if Qualcomm Drivers are already Installed. 2. Lumia 735 RM-1041 Added for Boot Repair via USB. Lumia 640 XL RM-1062 [02175.00002.15172.06006] [BIG BOOT] <– eMMC Tool Exclusive!!! Lumia 640 XL RM-1063 [02166.00000.15103.45007] [BIG BOOT] <– eMMC Tool Exclusive!!! Lumia 640 XL RM-1066 [02177.00000.15184.36002] [BIG BOOT] <– eMMC Tool Exclusive!!! Lumia 640 XL DS RM-1067 [02166.00000.15103.05001] [BIG BOOT] <– eMMC Tool Exclusive!!! * Super Special Thanks to Babak Nuri for Contributing more than 60% of the new eMMC Firmwares! Keep Requesting for more eMMC Part Numbers on that thread and we will keep Supporting them! —-> Expert Mode will increase your IQ by 3 points will make you really Smarter! * Now you can create your own SDC files for Samsung Phones Based on the 4 added SOCs. –> Added Samsung eMMC Write Protection Neuter. Posted in GPGIndustries News, GSMHosting News | Comments Off on ATF Special Update v12.34!! 26 JUN 2015!! Octoplus JTAG Software v.1.9.2 – One M7, Lumia 520 and more! – Samsung GT-S6500D – added Dead Boot Repair via JTAG, Repair IMEI, Repair CID (thanks to Mr.
Posted in GPGIndustries News, GSMHosting News | Comments Off on Octoplus JTAG Software v.1.9.2 – One M7, Lumia 520 and more! Medusa Box v.2.5.8 – One M7, Lumia 520 and more! – Added support for the following models:. HTC One M7 (PN07140) – added Dead Boot Repair via JTAG, Repair IMEI, Repair CID (thanks to Mr.
Samsung GT-S6500D – added Dead Boot Repair via JTAG, Repair IMEI, Repair CID (thanks to Mr.
Posted in GPGIndustries News, GSMHosting News | Comments Off on Medusa Box v.2.5.8 – One M7, Lumia 520 and more!